This is one engine that holds up very well in the used market. I’ve seen these routinely sell for 1000 and up. Minus the lack of quilable whistle and maybe 4 chuffs this models holds up well or better than compared to recent legacy offerings. I’m always on the lookout for c&o power and if one of these popped up on the bay or the forum for I expect from 800-1100. I personally wouldn’t feel comfortable paying more than 1k for even a NOS. It’s to close to current pricing in case of a re issue. It’s a fantastic engine though. I got chance to play with one for over an hour or so about a month ago and it makes you take a hard look for sure. The used market is very fickle. C&o holds up very well compared to other roads. F-19’s and H7’s especially. There are several tmcc versions of mallets and T’1s on the bay for well over 1k and to me that’s insane. But if you watch close deals can be had. I bought a f19 and a legacy T-1 for less than I was gonna pay for a new pre order on a new t-1. Just in the past month. Good luck on you search! Also be on the lookout for a new project in the works. C&O scalers group! Jeremy, Thank you for the response, if you pop on ebay now there are 4 mallets ranging from $100-1300. buy it now and auctions. I did not know how realistic that was esp with a few to chose from which would seem to indicate they are not hard to find. I was hoping they would actually be selling lower d/t the fact they are older with TMCC. But good to know in case I spot one at the lower end of price range. Another question how much value does an engine lose when it is well worn on wheelsets but cosmetically and functionally intact? I think it’s like used cars honestly. If you know where it’s been all it’s life and who took care of it and how then it make all the difference. Wear and tear Is really a tough thing to put a number on. I typically look for detail parts. You can learn a lot about a model based off how it was physically handled. Look at grab Irons and piping. Scratches. Etc. But there are so many variables. Who makes it, how old is it, Is it all here. If not what am I gonna need to make it 100% and what does that cost. To be frank I’m generally more comfortable buying some older stuff because my skill set in working with these trains has grown pretty vast and is ever growing. If your not that guy who is afraid to take a shell off and look around I think you have to look at it differently. Every engine I own has been opened up and inspected and treated accordingly. I actually seem to enjoy buying some older Lionel and mth engines and making some modifications and tinkering With them more so than getting a brand new engine out of the box. But it’s not for everyone. Personally When I buy used I treat it differently depending on where it’s coming from. If it’s off eBay it’s a tossup. The legacy Texas type I just picked up didn’t have an outer box at all and looked to be a mess. For 650 bucks I took a chance and what I got was a brand new, unrun model with all the original box contents. Runs perfectly! What are the odds right! I usually am a little bit more lax buying from the forum because you get to know everyone and bad reputations spread fast around here. And usually it’s a lot easier to get good info on something your Intrested in. Regardless if it’s eBay or the forum don’t be afraid to ask for more pictures and ask more questions. It can be tough though as good deals disappear quickly as many folks first stop on the forum is the for sale for new listings. Same with eBay and saved searches. Train shows of course when you can see it, hold it, run it. Is the best but here lately that seems to come with a price! In the end it’s all what your comfortable with and how you want to spend your dollars. I agree. I feel like if one can be had for 6-800 then sure maybe. But anything more than that your getting into legacy money. I truly fee for the guys dropping over 1000 dollars for tmcc engines. I just don’t understand. But whatever floats your boat. I think it's safe to say that a legacy H7 will be closer to 2k than 1k. If cost is a factor for the o.p. (sounds like it is) an extra $800+ to the price tag could be an issue. On a side note. Gryzyboskis shows a new one in stock for $1195 so that $1300 one on ebay is wayyy outta line. BTW . I've spent $1000 on 10 year old N.O.S scale steamers and have no regrets. I was rewarded with a fabulous fit and finish, tighter axle bushing and gearbox tolerances,no casting mold parting lines, the correct colored smokebox, no parts falling off, a smoke unit that works, and a fan that makes no noise. And they WORKED right out of the box ,as they do to this day. While EVERY legacy loco I have purchased, has needed some sort of repair, or has some sort of build/design, or decoration flaw. Right down to the electrocouplers which close better on the TMCC locos. They also don't make the "bzzzz" that is louder than the uncupoling sounds from the speaker like the legacy steamers. The best "price guide" is eBay; it's a national market - mostly the "Completed" and "Sold" listings, but the "For Sale" listings too, as this can be a hint as to sellers' current hopes, dreams and expectations - which can inform your expectations, too. It's the only place I go when I wonder what something is or is not bringing currently and recently. If you live in an area with bunches of train shows, that can be a real indicator, too, at least in your region. Most in the US don't live in that world. Thank you all for your insightful posts, it is helping me to start to understand the wide range of prices I see with Lionels big engines with all the different operating systems. Certainly a mine field for the uninitiated. Much like automobiles I guess...I am getting the general idea that many people view tmcc as a kind of a "classic" operating system? This engine and the f19 pacific with the vandy tender are long over due for a re issue. Some of the finest from the tmcc era. IMO. I bought a JLC H7 used 8 or 9 years ago long before the Legacy version was released. I think I spent about $900 then. My biggest problem with the JLC is the two chuffs per rev so I added magnets and a reed switch to get 4 chuffs per rev. That mod has held up surprisingly well over the years. The whistle is really unique. Note that the Legacy H7's were blown out on their part 2 run for 970.00, it was not a 2k engine, maybe on the next reissue? I purchased the UP version and really enjoy the sounds. Don't forget the 200 speed steps make a huge difference in slow speed. Which sites are best for blowout/clearance prices? I look at trainland now and then and like MBklein but are there other sites that I should be watching? I doubt if you will find a NOS JLC H7 at a great price. It's over 12 years old so the better discount dealers sold them out long ago. Most likely a dealer with an old, never used engine still has it because he didn't want to discount it, and still doesn't want to discount it off MSRP. 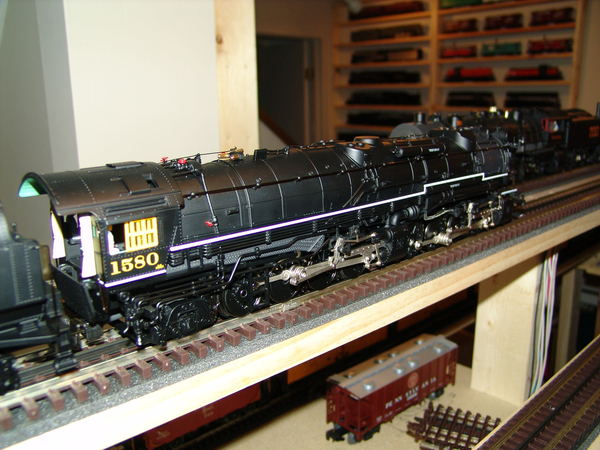 Your best bet on better pricing is a used one from ebay, a train show, or an auction. With the Legacy version in the marketplace now I wouldn't pay over $700 - $800 for the JLC version in good to excellent condition. it leaps to the first speed step too quickly especially for an engine with such small drivers. I've found that problem in most Odyssey engines especially the C&O F19 which has large diameter drivers. Replacing the traction tire on the rear engine is an adventure. The wheel with the traction tire is behind all the valve gear. You have to remove most of the running gear to get to it. I would imagine the Legacy version fixed all those issues except for the traction tire replacement. Thank you for your response it helps put things in perspective for me. on viewing the legacy mallets my only hangup is that I really like the vandy tender and I don't think that was offered with a legacy engine? 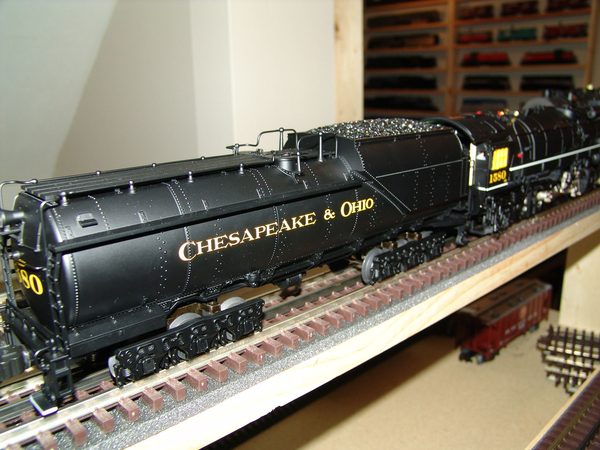 ..I am liking the looks of the usra 6-11299 though..i had a chance for one of these at $600. nos, is see now I should have grabbed it. The Legacy H7 does come with the Vanderbilt tender, The only things Lionel changed were the electronics and the road number (Incidentally according to info I have the Legacy H7 road number, 1578, in real life had a rectangular tender in the post 1930 paint scheme, not a Vanderbilt). The Lionel 6-11299 is a C&O H5 mallet. Very different engine from the H7. The H5's had the small rectangular tenders and I don't think they ever got a Vanderbilt. If any did it would have been a 12,000 gallon version. The Lionel version is a 16,000 gallon. I missed 6-11400..shame it is incorrect? So is it accurate that there are only two h-7s made by lionel with vandy tenders, 38058 and 11400? Kanawha, wasn't the H-5 a 2-6-6-2? I believe the 2-6-6-2 series ran H-3 thru H-5. But then again my ex-wife always told me I was more than likely wrong. I do have a pair of the Lionel 2-6-6-2s which are great on a small layout.